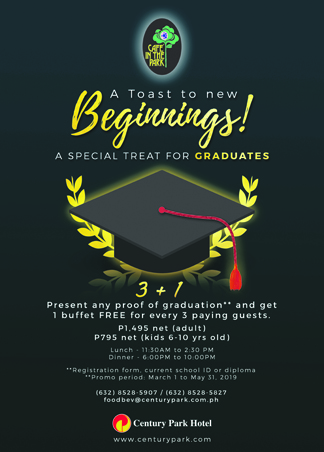 As graduation season fast approaches, Century Park Hotel (CPH) is giving a special treat of 3 + 1 to all students who are finishing the academic year with a flourish. From March 1 to May 31, 2019, there will be a free buffet (lunch or dinner) for every three paying guests at Café in the Park. Simply present any proof of graduation such as diploma, school ID or registration form to avail of the offer. Century Park features a daily themed buffet: French-Italian indulgence (Mondays), modern Filipino (Tuesdays), Mediterranean taste (Wednesdays), essence of Asia (Thursdays), western delights (Fridays), chef’s cpecial (Saturdays) and classic Filipino (Sundays). Buffet prices start at P795 net (kids 6-10 years old) and P1,495 net (adults).